A Russian stamp from 1999 celebrating Vysotsky. When you ask the average person who the greatest singer-songwriters are, the answers will be along these lines: Bob Dylan, Leonard Cohen, Joni Mitchell, John Lennon, maybe Carole King. If they’re more internationally-oriented than usual, you might get Jacques Brel, Victor Jara or Georges Brassens. But there’s a name missing from this list, hugely acclaimed in his home country but almost entirely unknown in the West: Vladimir Vysotsky. Within the Russophone world he is far and away the most famous “bard” — half-poet, half-singer. His songs are standard repertoire in Russian bars and around family gatherings, and though formed in the specific conditions of the post-Stalinist Thaw and Brezhnev’s Stagnation, they carry special meaning for Russians to this day. Vysotsky’s songs, with their mix of allegory, archetype and anecdote, appeal to the Russian sense of “Что делать?/ What can you do?” — endurance in the face of the indignities and demands of life. Paired with this, though, is the bard’s fiercely rebellious streak, as he spoke out in a cutting and lyrical way about living under an authoritarian regime. It’s perhaps for this reason that Vysotsky’s music has found some of its most ardent fans in formerly and currently oppressed countries, where his wry but humanistic commentaries ring true to people’s experiences. Though many have likened Vladimir Vysotsky to Bob Dylan, Vadim Astrakhan, who sings translations of Vysotsky’s songs in English, argues that his style and tendencies lean more towards “a Russian blend of John Lennon, Johnny Cash, and Tom Waits” than Bob Dylan’s literary style. Vladimir Semyonovich Vysotsky was born in Moscow on January 25, 1938, to a Jewish Red Army colonel from Kiev and his Russian wife. His childhood was spent evacuated during WW2 and then between his divorced parents’ homes. As a young adult he tried to make his way in the official Soviet acting schools but his rebelliousness (and sometimes drunkenness) worked against him. During his time as a student Vysotsky started performing in the underground music scene, singing first about the criminal underworld. His self-recorded tapes circulated among the unofficial artists and intelligentsia, but it was starring in the film The Vertical in 1967 which brought Vysotsky real fame. His songs, produced concurrently with his prolific career as an actor, became part of the mainstream Soviet culture. A photo of Vysotsky from 1979 at the Taganka theatre, playing his signature 7-string Russian guitar. With such immense fame, naturally Vysotsky worried the Soviet authorities. His incisive and critical songs were heard by millions as he toured the country and released records, and his (third) marriage to French actress Marina Vlady meant he was spending more and more time in the West. He walked the tightrope between officialdom and dissidence, but the authorities never pushed Vysotsky into open rebellion, preferring to keep him manageable and legal than ban him and face a riot. It is testament to his touring schedule and his songs’ power that he managed to attract so many fans despite never being allowed on Soviet television. During his meteoric rise in the 70s Vysotsky’s problems with drink and drugs deteriorated. His wife describes the strain that his substance abuse had on their relationship in her bestselling memoir, and though details of Vysotsky’s personal life were often obscure, this is one area where the facts are more known. His work was certainly influenced by his drinking, with darker themes emerging during the late 70s, and from about 1977 he was also self-medicating with amphetamines and prescription drugs. As 1980 rolled in, and the Soviet authorities made drugs harder to acquire during the Olympic games, Vysotsky went back to hard drinking. Drug withdrawal was gruelling, though, and over a four-day period from 21st July, he went into medical supervision at his home in Moscow. On the morning of the 25th, he was found dead. No official notice was made of his death, but tens of thousands of fans mourned him at the Taganka theatre where he had been playing Hamlet. The Soviet authorities sent the army in, fearing a riot. Vysotsky’s legend only grew in the years following his death. By 1989 his legacy was so firm that, when the Berlin Wall fell, memorials and statues to Vysotsky sprung up across Russia and the Eastern Bloc. Vysotsky memorial in Samara, Russia. Image credit: Yuri Vantsev. Vysotsky’s output was so prodigious that to narrow it down to a few “greatest hits” would be folly, but here is a selection to help get you into the poet’s music. This was the first that many Russians heard of Vysotsky, as it was featured in the film The Vertical. It encapsulates Vysotsky’s grasp of idiom and metaphor, describing how hardship and opposition are the keys to telling when a friend is a true one. Vysotsky’s songs often build up, verse by verse, until the ironic meaning is clear. This is one such song, where the narrator’s boredom and annoyance with life are layered into a critique of Soviet society at large. This is one of Vysotsky’s most searing songs, and probably my favourite — the extended metaphor of the way a hunt traps wolves reflects Vysotsky’s rejection of authoritarianism and desire for new, liberated ways of thinking. His voice, like whiskey over gravel, crackles and snarls with righteous fury until it’s hard to believe you’re only hearing one man and his guitar, and not a whole symphony at full tilt. This is another wry commentary on life and its indignities, with a trademark twist at the end. The staying power of Vysotsky as a cultural icon can be put down at least in part to the way his songs can be covered by almost anyone. This video is from Vadim Astrakhan, who’ll be performing his English versions of Vysotsky’s songs (with a few Russian ones thrown in) on Thursday 18th April at Pushkin House. Tickets and further details are available here. 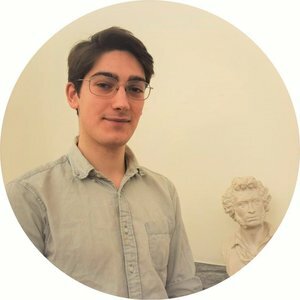 Rafy Hay is Events Manager at Pushkin House, and edits the Pushkin House blog. If you have an idea for a blog submission, please feel free to email him at rafy.hay@pushkinhouse.org.uk.